Louis XV, the Well-Beloved, became the King of France at the age of five, upon the death of his great-grandfather, The Sun King, Louis XIV. Raised by a set of serious-minded tutors, Louis started as a solemn child with much promise, but developed a fierce revulsion to uneasy situations, and so allowed his ministers to rule while he enjoyed pleasurable pursuits. This the people forgave him in his youth, but as the years passed, and his mistresses became more demanding, the songs and pamphlets began and a dissension, the precursor to the French Revolution, started to brew in Paris. Louis was a charming bridegroom and faithful throughout most of the Queen’s childbearing years, but when she turned him away in exhaustion, courtiers, such as the Duc de Richelieu, took the chance to arrange his amours. The first succession of mistresses were sisters, though each different in personality. His most celebrated paramour, Madame de Pompadour, makes her entrance and continues in the next book. The mood of the people is violently set against certain aspects of the Old Regime, but is not yet at its zenith. “There should be a road from Versailles to Compiegne which skirts Paris. There shall be such a road.” The story continues with The Road to Compiegne. There are several back stories related, such as Charles Edward Stuart (Bonnie Prince Charlie, the Young Pretender to England’s throne) and his romance with Louis’ second daughter, Anne Henriette. Louis was like George III of England in that he preferred his daughters unmarried, only allowing the eldest of eight to marry. The odd Etiquette of Versailles is described as a character in itself, along with eccentricities of court life. I’ve often wondered why the author didn’t write a novel in the voice of Madame de Pompadour, as she did with Madame du Barry, but as she plays a significant role in this trilogy, perhaps the story was thoroughly covered. Madame du Barry’s story surpasses Louis XV’s and ends during the bloodiest days of the French Revolution. “Wars, riots, religious dissension, the enmity of Parlement, the intrigues of the Dauphin, and the hunger of his people left Louis XV unmoved. 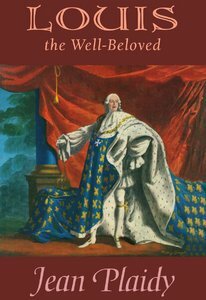 No longer the Well-Beloved, he ignored the dangers facing France, seeking refuge from any unpleasantness in extravagance, folly and undisguised sensuality.